Dimensions 1 by 6 by 8 in. Amazon.com description: Product Description: The man Business Week calls "the ultimate entrepreneur for the Information Age" explains "Permission Marketing"âthe groundbreaking concept that enables marketers to shape their message so that consumers will willingly accept it. Instead of annoying potential customers by interrupting their most coveted commodityâtimeâPermission Marketing offers consumers incentives to accept advertising voluntarily. Now this Internet pioneer introduces a fundamentally different way of thinking about advertising products and services. 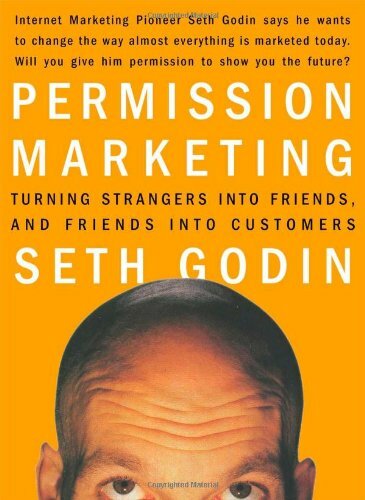 By reaching out only to those individuals who have signaled an interest in learning more about a product, Permission Marketing enables companies to develop long-term relationships with customers, create trust, build brand awareness -- and greatly improve the chances of making a sale.